Where’s the brightest place on Earth – the place that is illuminated most when the Sun has gone down? New York’s Times Square perhaps… what about the glow of office lights around London’s business district… or maybe the bustling heart of Mumbai, the world’s most populated city. They’re all pretty bright, but of course nothing could beat the flashing, colorful sea of lights that make up Las Vegas – the brightest place on Earth. NASA has just released some new images of our planet at night, and I think it’s really fascinating to see what they tell us about our civilization. Until not long ago, most of Saudi Arabia was a vast desert, void of human habitation. But now its cities are bustling, and as their population increases, so does its brightness. 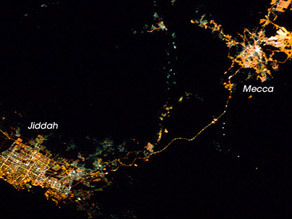 I love the little strip of light connecting Jeddah and Mecca in the photo on the right – that’s the tiny but well-illuminated road linking the two cities. It’s also really interesting comparing cities by day and night. The photo on the left is Chicago – as soon as darkness comes the gray and brown sea of buildings is turned into a mass of light, coming from every building, road and shop. So how did NASA get these photos? It’s not as easy as you’d think – you have to bear in mind that the ISS (where these photos were snapped from) moves about 7 miles a second above Earth, and combined with the long exposure times necessary for such a dark photo, it’s difficult to avoid getting blurry photos, as any photographer will know. The solution was to create a camera mount that rotated really slowly, to compensate the movement of the ISS. The result: beautiful pictures showing the amazing things humanity is capable of. The only problem is that sometimes our lights go too far – many city-dwellers can’t see more than a handful of stars because artificial lighting lights up the sky so much. I’d really recommend looking at the International Dark-Sky Association‘s website – they’ve got loads of tips about how to reduce light pollution. But before that, just appreciate how fascinating our planet looks when it’s dark. I really enjoy looking at satellite photos — they really show us in a whole new “light”! It’s interesting to consider how much energy is going into all that lighting — and activity — in the richer and more populous countries, and whether the folks who live in the “darker” areas are living good lives without needing all that bright light. you people have been to mecca and madina? I think not. ordinary lights gathered together cannot make such brightness on the space!!!! see the first photo released by nasa!!! Can’t see right hand image , may be the link for that pic has broken or it has been cencered , but don’t worry you could get that from google map as well. why they took out the pics ?? cos they don t want u to know the truth . while seeing america loden looks bright but i see belgium also bright the whole land is bright notlike amerika and uk…. Oops! I couldn’t be able to see the picture as it is not opening. Nevertheless, i’ve seen how brighter Mecca and Madina from aerial view of earth in google image search. That was really nice clicks to see.